While the news coming out of forests is often dominated by deforestation and habitat loss, research published today in Nature Climate Change shows that the world has actually got greener over the past decade. Despite ongoing deforestation in South America and Southeast Asia, we found that the decline in these regions has been offset by recovering forests outside the tropics, and new growth in the drier savannas and shrublands of Africa and Australia. Plants absorb around a quarter of the carbon dioxide that people release into the atmosphere by burning fossil fuels. With a greening globe, more plants may mean more absorption of carbon dioxide. If so, this will slow but not stop climate change. However, questions remain over how long plants can keep pace with our increasing emissions in a warmer climate. We studied how plants and vegetation are faring by determining the amount of carbon stored in living plant mass (or “biomass”) above the ground. We developed a new technique to map changes in vegetation biomass using satellite measurements of changes in the radio-frequency radiation emitted from the Earth’s surface, a technique called passive microwave remote sensing. The radiation varies with temperature, soil moisture and the shielding of water in vegetation biomass above the ground. We extracted this vegetation information from several satellites and merged them into one time series covering the last two decades. This allowed us to track global changes in biomass from month to month, something that was not possible before. For the period 2003-12, we found that the total amount of vegetation above the ground has increased by about 4 billion tonnes of carbon. Our global analysis shows losses of vegetation in many regions, particularly at the frontiers of deforestation in the tropics of South America and Southeast Asia. As expected, the greatest declines have been in the so-called “Arc of Deforestation” on the southeastern edge of the vast Amazon forests. 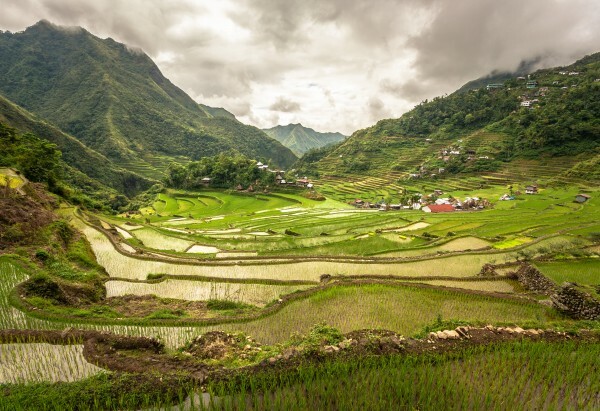 In Southeast Asia we found the most widespread declines in the Indonesian provinces of Sumatra and Kalimantan – the Indonesian part of Borneo. However, we found that these rainforest losses have been offset by increases in biomass in other parts of the world. For example, forests have spontaneously regrown on farmland abandoned after the fall of communism in Russia and neighbouring countries, while large-scale tree planting projects in China have measurably added to the global biomass. This roughly offset half of the carbon loss by tropical deforestation. 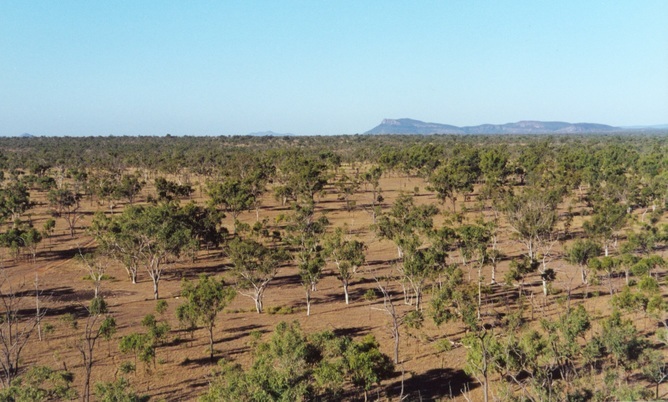 We also found unexpectedly large vegetation increases in savannas and shrublands of Australia, Africa, and South America. Previous analyses have focused on closed forests and did not measure this increase. Vegetation in savannahs and shrublands was ignored in previous studies. On average, Australia is “greener” today than it was two decades ago. This is despite ongoing land clearing, urbanisation and the recent droughts in some parts of the country. However, the increase in vegetation has not been uniform. The largest increases are in northern Australia, with lesser increases in southern Australia and a small decrease in southeastern Australia. Mean annual change in vegetation biomass between 1993 and 2012. Blue represents an increase; red a decrease. These vegetation trends seem to be mainly explained by rainfall patterns: northern Australia has been getting wetter and southeast Australia dryer. This pattern is predicted to continue according to the most recent climate change projections from the CSIRO and the Bureau of Meteorology. 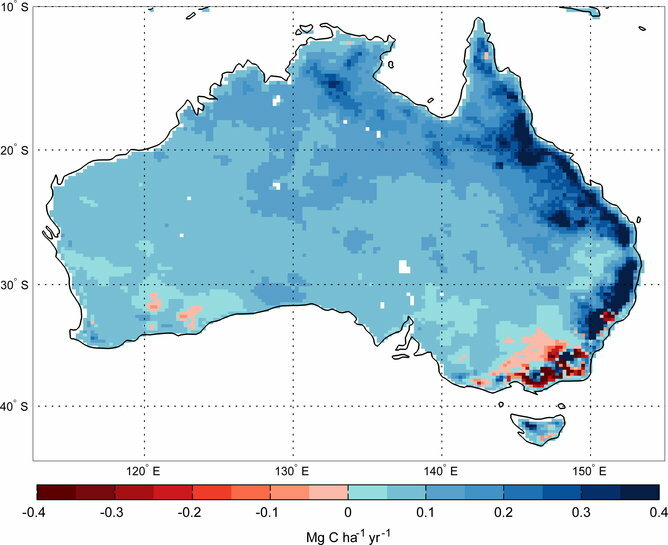 Australian vegetation growth generally responds strongly to rainfall variations. More variability and an apparently increasing frequency of extreme El Niño and La Niña events due to climate change would create stronger boom-bust cycles in Australia’s vegetation. Apart from the effect of rainfall patterns, our study also agreed with other studies observing a gradual greening trend for the past two decades, even where there was no change or even a small decrease in rainfall. This has been ascribed mainly to the increasing number of trees and shrubs growing on semi-arid grasslands. These plants are more efficient water users than other plants such as grasses. With the increased atmospheric concentration of carbon dioxide from fossil fuel emissions, they are able to absorb more carbon from the atmosphere without using more water. The world’s vegetation plays an important role in slowing down climate change. About a quarter of all carbon emissions from human activities are removed by terrestrial vegetation, with the size of the carbon land sink increasing over time. However, it remains to be seen how the increased climate variability that accompanies climate change will affect this terrestrial “carbon sink” in future. This is particularly true for seasonally dry ecosystems that experience fires, such as Australia’s savannas, where a single fire event can easily remove the carbon stored in plant biomass over many previous years. The future interaction between climate variability, vegetation and fire is difficult to predict and remains the focus of intense research. Overall, our study provides more direct evidence of the global increase of vegetation growth and the terrestrial carbon sink than previous studies, with unprecedented geographical attribution and year-to-year changes. With terrestrial vegetation removing about a quarter of the carbon emissions from human activities and the global oceans removing another quarter, this means that half of our CO2 emissions remains in the atmosphere. Therefore, stabilising concentration of CO2 in the atmosphere and the consequent impact on the climate system will still require large reductions of global fossil fuel emissions. Yi will be on hand for an Author Q&A session between 10 and 11am AEDT on Wednesday April 1. Post your questions about the article in the comments section below.